Among the finest later films of Claude Chabrol, here he once again uses a murder mystery to expose the underlying tensions and deceptions of a close-knit community. A 10-year-old girl's violated body is found in the woods of a Brittany fishing village. Suspicion immediately falls on Rene (Jacques Gamblin), a painter and the girl's art teacher; he is apparently the last person to have seen her alive. A cast of leading European stars powers the tense drama Color of Lies , an intense, psychologically charged crime mystery from master filmmaker Claude Chabrol. The digitally remastered film makes its U.S. Blu-ray debut on May 20, 2014, from the Cohen Film Collection, with an SRP of $39.98; the simultaneously released DVD has an SRP of $29.98. 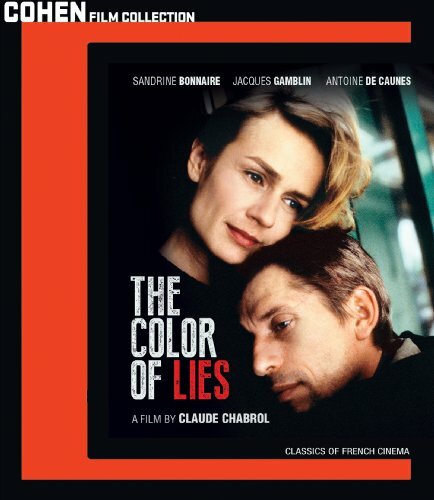 Color of Lies (1999) is among the finest later films of Claude Chabrol, whose prolific career ranged from the start of the New Wave until his death in 2010 and includes such classics as Les Cousins, Les Biches, La Femme Infidele, The Flower of Evil and La Ceremonie. As in many of his suspenseful films, here he once again uses a murder mystery to expose the underlying tensions and deceptions of a close-knit community. A 10-year-old girl's violated body is found in the woods of a Brittany fishing village. Suspicion immediately falls on Rene (Jacques Gamblin, Safe Conduct, Inspector Bellamy, The First Day of the Rest of Your Life), a painter and the girl's art teacher; he is apparently the last person to have seen her alive. The inspector in charge of the investigation (Valeria Bruni Tedeschi, Munich, 5x2, Those Who Love Me Can Take the Train) immediately questions him. In this provincial town where the residents all know each other, Rene becomes increasingly unsettled by his neighbors' suspicions and by the inspector's investigation. Children stop coming to him for lessons. His beloved wife, Vivianne (Cesar Award winner Sandrine Bonnaire, Vagabond, A Nos Amours, Intimate Strangers), a nurse, protects and supports him, but is tempted by the advances of an arrogant local TV personality (Antoine de Caunes in a brilliant performance). True to form, Chabrol is less interested in whodunit mechanics than in dissecting a culture of lies - from advertising to adultery - that permeates modern society. Also starring in this unforgettable film are Bernard Verley (Chloe in the Afternoon, The Phantom of Liberty), Pierre Martot (The Swindle, Betty) and Bulle Ogier (The Discreet Charm of the Bourgeoisie, Maitresse). Nominated for the Golden Bear at the 1999 Berlin Film Festival, Color of Lies was universally praised by critics. Writing in The New York Times, Terrence Rafferty said it "has the resonance of a masterpiece. And like all masterpieces - especially those of Claude Chabrol - it also has the audacity of a perfect crime." The Village Voice's Michael Atkinson called it "a superb sociological mystery," while Variety's Lisa Nesselson praised its "delicious sense of suspense." Michael Thomson of BBC Films said Chabrol "is still (after a hugely busy career) able to breathe life into suspense with subtlety, irony and humor ... Chabrol, forever asking us to spot detail, ensures that every one counts. A work of superior acting and quiet strength." In addition to the digitally remastered feature, the Blu-ray and DVD of Color of Lies both include running joint commentary by critics Wade Major and Andy Klein, among other extras. Formed in 2008 by Charles S. Cohen, an executive producer of multiple Academy Award nominee Frozen River, the COHEN MEDIA GROUP, LLC (CMG) produces and distributes select films throughout North America. Current and upcoming CMG releases include Lorraine Levy's The Other Son (winner of the Grand Prize and Best Director prize at the 2012 Tokyo International Film Festival); French director Francois Ozon's thriller In The House (San Sebastian Film Festival's winner of the Golden Shell and Best Screenplay award; Spain's official entry to the Academy awards, Blancanieves; Fernando Trueba's The Artist and the Model, starring Jean Rochefort and Claudia Cardinale; and Lebanese director Ziad Doueiri's The Attack, based on the international best-selling book by Yasmina Khadra. CMG's Cohen Film Collection (formerly the Rohauer Collection) includes some 700 cinema landmarks, including films by D.W. Griffith, Buster Keaton and Douglas Fairbanks, as well as foreign classics like Luis Bunuel's Tristana. Bonus features: audio commentary by critics Wade Major and Andy Klein; 2014 re-release trailer.